The search bar at the top of the page searches through all your email to help you find stuff. It is incredibly powerful and does a fantastic job of pulling up relevant results, so I use it often. This was confusing to me when I first started using Gmail, but it’s quite lovely once you understand it. Once you’ve responded to an email or want to keep an email but don’t need to see it in front of you in your inbox, then archive it. It doesn’t delete it, but it doesn’t clutter up your inbox any longer. You can easily find the email in the future by searching for it using the search bar at the top. Labels are much like folders in other email clients, but they are a bit more useful. The nice thing about labels is that a single email can have multiple labels, so you don’t have to copy your message into various folders if it needs more than one category. I started out using lots of labels (one for each client, for example) and found later that this was an unnecessary step because the search was so good that if I wanted to see all the emails from a client I simply had to search for their name and it brought up a list of emails. So before you go and make 50+ labels like I did, think about if it would be easy to find in a search (by searching for someone’s name, a topic, a keyword, etc). Some things, such as receipts for online purchases that you need at tax time, come from lots of different vendors and would be hard to search for without doing multiple searches. So it’s very useful to have a “receipts” label, but not nearly as useful to have a label for a single client. Simplicity is key, and you don’t need lots of labels (trust me). I do like to label all my wedding inquiries, which ones I was already booked for, and then which ones set up a consult. It’s an easy way for me to track them and get all nerdy an analyze my statistics and bookings ratios and all that stuff that only dorks like me get excited about. I suggest using the following labels: “respond”, “to-do”, “read”, and “receipts”. You may also consider creating labels called “clients” (for all clients, not each client individually), “orders”, “contracts”, and “login information” (when someone emails you login information for a site you joined) but I feel like the first four are the main ones I’d get started with. To create a label, click the label button, select “Manage Labels” and create any labels you want to use. 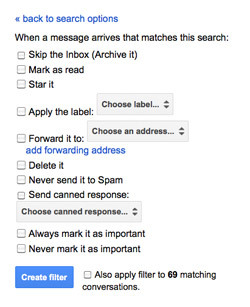 Once you’ve labeled an email, you can simply archive it and no longer shows up in the inbox. To see it again, click on the label on the left or search for the label using the search function and it will show up in that list. This was the most amazing thing about switching email providers from me. Basically, when you reply back and forth with someone several times, instead of getting a new email in your inbox each time, it simply adds on to the old email without creating a new one in your inbox. Saves a TON of clutter, and it keeps everything inside the conversation even if you forward part of it to someone else. It’s really awesome for client interactions. We’re going to talk about the strategy behind using filters more in part 4 of this series, but basically a filter is a rule that you create in Gmail that tells it to always do the same thing to your email based upon what the email contains or where it comes from.. So for example, I created a filter for any messages that contain the word “receipt” and come from Amazon, Adorama, B&H, ProDPI, or other vendors I use often to automatically be labeled “receipt”. 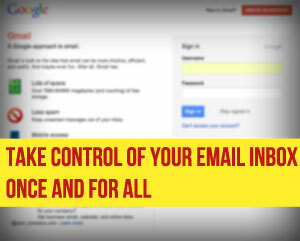 You could also choose to have something skip the inbox, be marked as read, or a number of other options. Task for Day #2: Create labels for your emails, including the suggested labels above. Tomorrow we’ll be exploring some of the Google Labs that are useful for photographers, and after that is where things really start to get good. Go to part 3 now. How do you currently organize your inbox? Leave a comment below with the answer.